The Chemours Co. has announced the startup of a new production facility for the new Opteon YF (HFO-1234yf) low global-warming-potential (GWP) refrigerant at its Corpus Christi manufacturing plant in Ingleside, Texas. This facility will enable Chemours to triple the global capacity of its hydrofluoroolefin (HFO) 1234yf-based products to meet increasing market demands for more environmentally sustainable refrigerants and blends. The Opteon YF (HFO-1234yf) refrigerant production facility is the largest such facility in the world, according to The Chemours Co. It comes at a critical time when the world is transitioning to the next generation of refrigerants to achieve long-term sustainability, the company added. 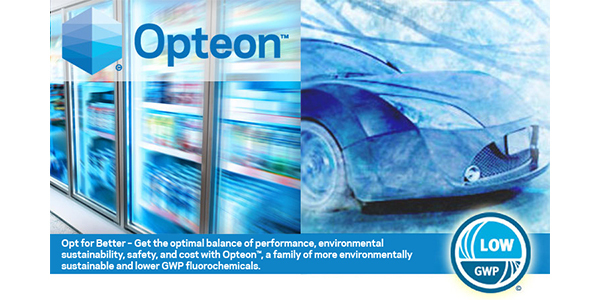 Chemours’ Opteon YF refrigerant used in automotive air conditioning has a GWP that is 99.9 percent lower than the refrigerant it replaces. This helps lower the greenhouse gas footprint for motor vehicles and is a significant path to meeting environmental global-warming regulations around the world, the company said. The Corpus Christi site uses an innovative, patented process to manufacture Opteon YF for automotive air conditioning and refrigerant blends that are used across a range of applications.